You are here: Home / Podcast Episodes / BK27: Are You Your Own Rock? 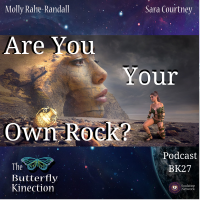 BK27: Are You Your Own Rock? Molly and Sara have a candid discussion about their own experiences of inner strength. They go in depth about how we need to support our own selves, be our own rock, and what that looks like. They pose some important questions such as: Do you support your own self? Are you lifting your own self up or are you looking to others to lift you up in times of need? Are You Your Own Rock? Molly and Sara give very different individual perspectives on inner strength and being a rock. 2:19-Molly shares her story and insights of learning to be her own rock as a child and young adult. 5:42-Sara shares her child story of not feeling strong or a rock for herself. Molly shares her realizations during her childhood experience and how she continued to believe in herself and knew everything would be ok if she did the work with God’s help. She knew she was not alone. It’s important to realize that we are not alone and that we need to find the group of people who we want to surround us and who are willing to support and honor us. Then we won’t need others to be our rock. Instead those people can help us to see that we are the rock. Being a rock means believing that no matter what happens in life, we can pick ourselves back up again and keep moving forward. And if we all take the time to honor ourselves, get to know ourselves, and believe in ourselves, then we can find our own identity. By finding our identity, we can be a rock for ourselves. 12:45-Molly recites a beautiful mantra. Look for Soul Reflections Academy on our website and sign up for our Free Soul Reflection Challenge. A new challenge will be posted weekly! For more of The Butterfly Kinection, follow us on Facebook, Instagram, Pinterest and our website. To receive information on special offers, new products, upcoming podcasts, new classes, or our newsletter, subscribe to our email list HERE!